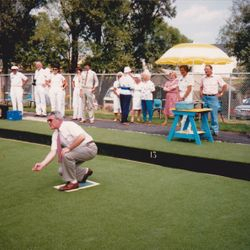 In 1983 a few avid bowlers from Dartmouth came up with an idea, why not have a lawn bowling facility in Dartmouth. That way, they would not have to travel the bridge to enjoy the game that they loved. A letter was sent to Condo Sarto (Alderman for Dartmouth East) asking for his support. The few avid bowlers were Harvey Hodgins, Betty Hodgins, June Hodgins and Dennis Mullane. In September 1983, a steering committee was formed. Members of this original committee were Harvey Hodgins, June Hodgins, Dennis Mullane, Betty Hodgins, Faye Miller and Faye Thornham. Another letter was sent to the Mayor Brownlow to encourage the idea of a lawn bowls facility in Dartmouth. The years past and one site was picked and shot down, another site picked and shot down. It was one postponement after another until finally Jim Lawton came along and suggested the lands beside the Woodside Fire Hall. Finally a site that was agreeable to all. Construction began in the Fall of 1986. 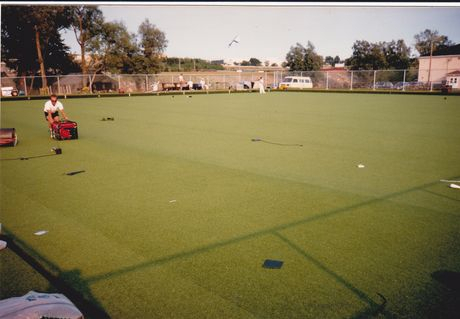 In the Spring of 1987, Woodlawn Construction laid the foundation and then Omni Sport began laying the artificial turf. On August 15, 1987 the green opened and we held our official grand opening with the first bowl delivered by Mayor John Savage. 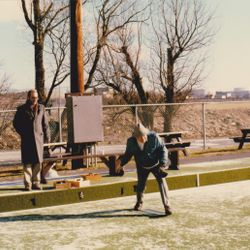 The following day, the 1987 Canadian Championships began play in the Halifax/Dartmouth area with the Dartmouth Lawn Bowls Club playing host to the Fours competition. The election of officers took place in October 1987, with President Harvey Hodgins, Vice President June Jessome, Second Vice President Vince Hodder, Secretary Evelyn Jones, Treasuer Jeff Ellwood, Membership Judy Everard, Match Lou Jessome, Maintenance Jim Lawton, Public Relations May McClintock, Social Judy Hanson, Ways & Means Wally Jones, Development Lou Jessome, Officiating Betty Hodgins, Senior Program John McClintock and Junior Program Dan Watters all elected to serve on the first executive of the club. 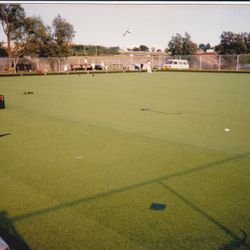 Since then, the club has been a major centre for bowls not only in the province of Nova Scotia but in the country. Events are regularly held at the club, making the greens a major hub for the sport in the province, with play on the greens almost every day of the Summer. 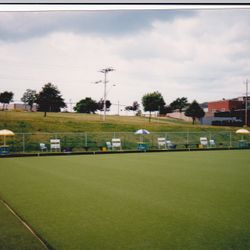 The club has hosted many major championships both for Lawn Bowls Nova Scotia and for Bowls Canada Boulingrin. The club has hosted the Canadian Championships in 1987 and 2008, the Canadian Senior Triples Championship in 2010 and 2016 and are now preparing to host the Canadian Junior and Under 25 Championship in 2017. At our 25th Anniversary Party in September 2012, five members received 25 year pins from Bowls Canada Boulingrin in recognition of their commitment to the Dartmouth Lawn Bowls Club and in the promoting of the sport.